We’re thrilled to introduce our very first coffee from Peru. Confesor Tizillahuanca is one of the 30 farmers who make up Finca Churupampa in the region of San Ignacio, Cajamarca. Confesor has been growing coffee all his life, and five years ago he decided to change focus to specialty coffee because he wanted to improve his life and the quality of his farm. Since then, his higher quality crops have earned better prices and he has been able to invest more on his farm and infrastructure. This way, he says he can deliver a better product to final consumers of his crop. Finca Churupampa was started in 2011 with the aim of creating a model of sustainable, organic, integral, and productive coffee farms. Now made up of more than 30 coffee growing families who share in that goal, and together produce the best coffee in the region. They have educated their members to improve their farming practices, drying processes, and infrastructure. This year our sourcing partner Caravela’s education team is partnering with the technical team at Finca Churupampa to develop a long-term sustainability strategy, to further improve their specialty production areas, and to foster community support groups for all 30 families that are part of Finca Churupampa. We hope this is the first of many years we’re able to share coffee from these quality and sustainability-focused growers. 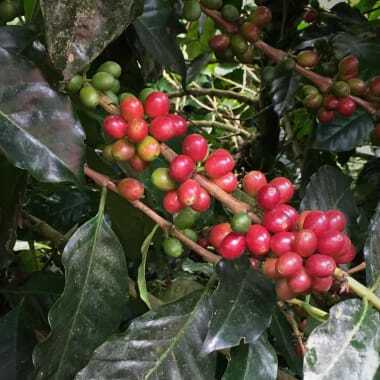 What makes up Peru Confesor Ticillahuanca Finca Churupampa? Created by the Instituto Agronomico do Campinas in Brasil, Catuai is a hybrid varietal between Caturra and Mundo Novo. Peru is well suited to coffee cultivation and production, given its high altitude and climate.